The EURUSD offers great opportunities for the call and put trades on binary Cent platforms, based on critical, technical price patterns and fundamental events. Read on as we take a look at a couple of these fundamental announcements as well as major technical price patterns moving the foreign exchange of the pair. 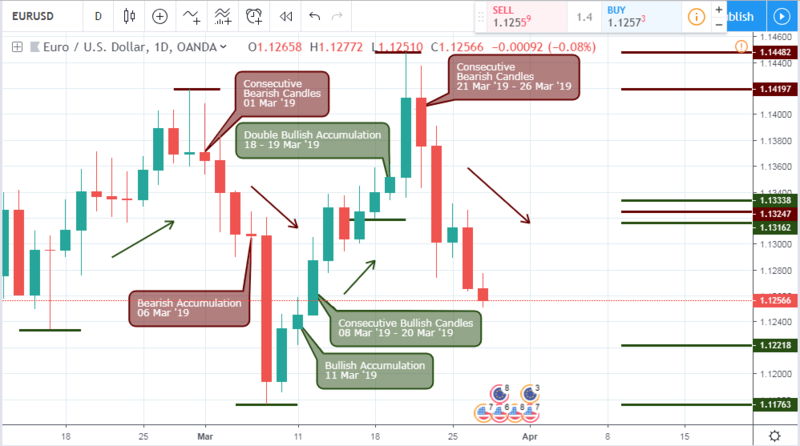 President Draghi’s speech on Wednesday, March 27 ’19 was interpreted as dovish for the Euro, leading to a bearish price close of the EURUSD on that same day. The speech was already anticipated to be bearish a few days earlier as you’ll later see on the 4hour chart of the EURUSD. The European Commission will on Thursday, March 28 ’19, release the Business climate indicator which is based on surveys carried out within a monthly period and designed to give a distinct assessment of the oscillatory motion within the Eurozone. A high reading from the survey implies that a healthy economic cycle, while a low reading points to an unfavorable cycle for the Euro. An increase in the indicator depicts an upswing and growth in the business climate, which is associated with industrial production in the Eurozone. The Bureau of Economic Analysis will on Thursday 28, March ’19, publish the annualized (GDP) Gross Domestic Product. The GDP of a nation, in this case, the US, shows the pace of growth or decline of the economy. Therefore, a higher than expected result is considered bullish for the USD, while a weak reading implied a bearish sentiment. The US GDP is an entire measure of market activities that shows the monetary value of all goods and services produced in the US. Entering a strong bearish trend following a bullish trend of equal magnitude is the monthly chart of the EURUSD. The main goal of our analysis is to figure out what time frame the consecutive bars are at, and from the above chart, the consecutive bars are a step above the monthly chart, which is more like quarterly bars. 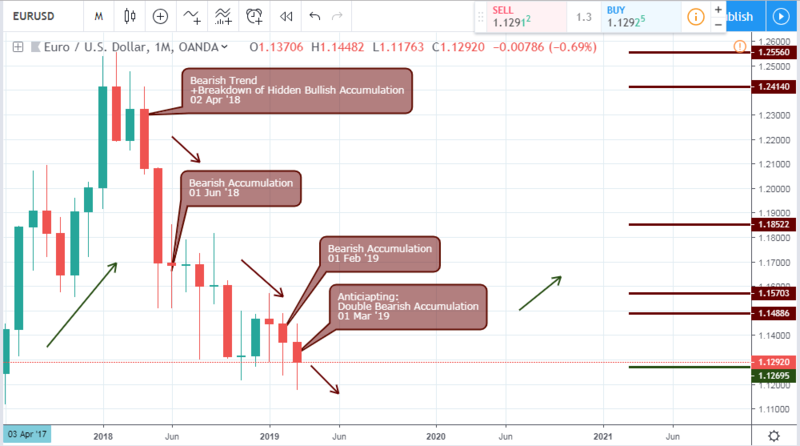 A breakdown of hidden bullish accumulation on 02 April ’18 sends the foreign exchange of the EURUSD plummeting. A bearish accumulation on o1 June ’18 fueled the bearish descent, sending the pair further south by a total of 7.38% from the failure of hidden bullish accumulation. 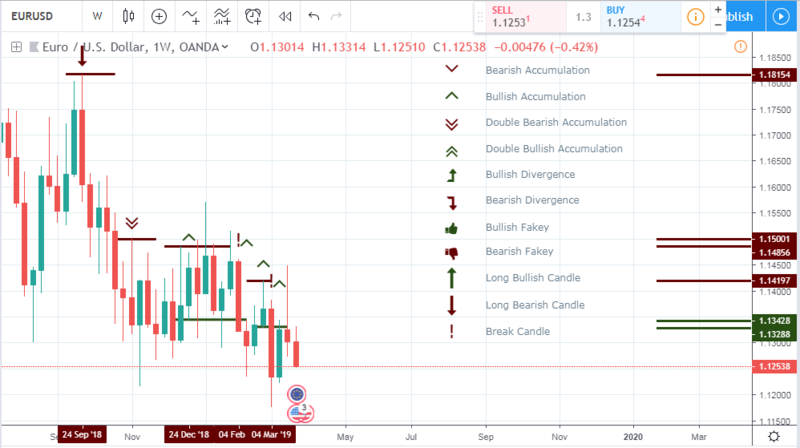 More recently on 01 February ’19, we notice a transition from bearish to bullish price pressure through bearish and bullish accumulation patterns, an indication that the pair is still in a bearish trend, with resistance levels at 1.15703, and 1.14886. We bring a little twist to the representation of patterns on the weekly chart. Using the legends on the right of the chart, you’ll get an understanding of the patterns at play on the weekly time frame. Starting with a dark cloud cover pattern on 24 September ’18, price entered into a rapid bearish decline for about 3.6% in total. Coming to the end of the bearish trend, the pair triggered a double bearish accumulation on 05 November ’18, and bullish accumulation on 24 December ’18. Of all the major currencies, the USD proves stronger than the Euro as price breaks below the bullish accumulation resistance on 04 February ’19 and more recently on March 04 ’19. The above daily chart shows price swinging from consecutive bearish closing candles to bullish closing candles, and currently bearish closing candles. The 4hour time frame throws more light on the pattern build up, but before doing that, we’ll like to bring your attention to the collapse of hidden bullish accumulation on 02 March ’19; The bullish accumulation on 11 March ’19; and the bearish inside bar on 21 March ’19. Finally, on the 4hour time frame, price triggers a bearish accumulation, as confirmation for the consecutive bearish candles on the daily chart. 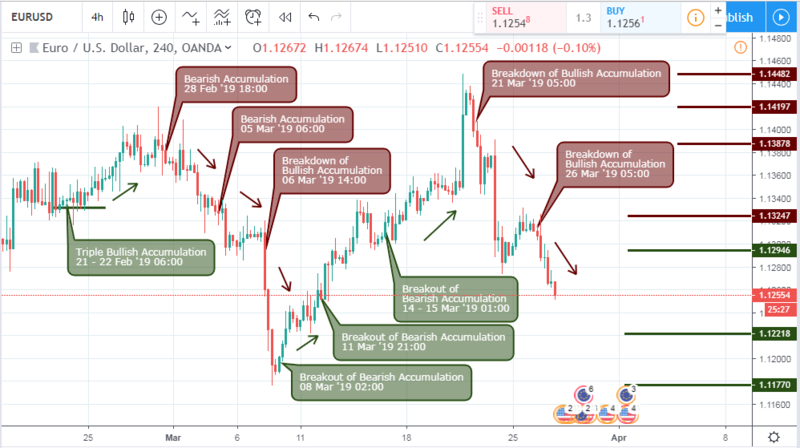 A breakout of bearish accumulation was triggered on 08 March ’19 02:00 as early confirmation to the bullish accumulation and consequently the bullish swing; and a failure of bullish accumulation on 21 March ’19 05:00 as confirmation to the current consecutive bearish candles we are in. With the fundamentals pointing towards a stronger USD against a weak Euro, the pair maintains a bearish outlook. The goal of our top-down analysis is to figure out where the next consecutive candles will be. Well, the monthly chart shows that the consecutive bars of the EURUSD is on a higher quarterly chart and the daily chart. The EURUSD is still bearish and a bearish close of the current month within the high-low range of February will confirm a huge selling pressure.